“That’s the last one until 18 miles,” panted a runner just beside us as we crested the big hill at five miles into last Sunday’s Loch Ness marathon. Through the tree cover on our left broke a view of the loch itself a couple of hundred metres below, as calm as a TBH coaches meeting. The scenery, the clean air, the way we’d driven up the undulations between three and six miles and then caught all those 7-min milers who’d left us at the start line as we paced ourselves at 7.40 m/ms, it all felt incredibly good. With rumours from Club Treasurer Dave Moir that the course was a hard, hilly route, we started to wonder what all the fuss was about. All of a sudden 3.20 looked more than achievable. 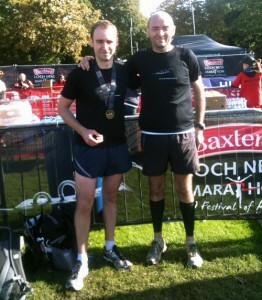 This was Alex’s fourth marathon, and Chris’s first. 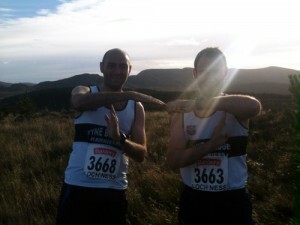 With a conservative target of 3.20 based on our performances at the Great North Run we both felt confident. Everything was going to plan and whilst the uphill sections ate into our pace it wasn’t as much as we’d feared; and then the down hills were providing respite and a good average pace. We powered on. We reached 8 miles with relative ease, and Chris turned to Alex and commented how the aches and pains of the weeks running up to the marathon, Chris’s knee and Alex’s broken toe, were nowhere to be seen. We reached halfway comfortably at 1.38, two minutes ahead of schedule. Alex had a minor wobble at 9 miles with a sore hip flexor, but that had disappeared. Chris felt full of running, his stride long and effortless. The following miles were bliss, hitting our exact pace with ease until mile 16. At this point we were running directly beside the loch and the views were everything to be as expected (sadly, no sign of Nessie!). And there, for some reason, it started to go a little bit awry. It had all begun so well. An incredibly friendly and supportive Inverness Park Run had been run on the Saturday morning, where we’d met fellow marathon tourists and Parkrunners from London and Bradford, and finished a mightily respectable 4th (Chris) and 5th (Alex) in the field of 44. After a relaxing Saturday in Inverness (“It’s almost like Paris,” said Alex, impressed with the civility of the city, after we’d recovered from seeing our first drunk Scot arrested no more than three minutes off the train) we’d got an early night, and were up with the alarm at 6.30 to begin the journey to the start line. 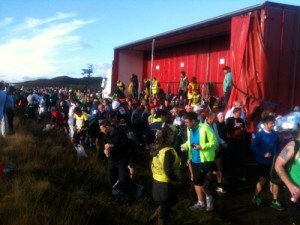 The pickup point was Inverness ice rink, where over sixty coaches and double-decker buses were full to the brim with runners. The sight of fluorescent clothing scurrying around the place made a marvellous spectacle. With military precision we set off in convoy headed for the wilderness snaking through the countryside to the southern end of Loch Ness. The sight from the back window of the bus was extraordinary; the long succession of buses bumper to bumper veering around the narrow country roads framed by the spectacular highland scenery, the familiar smell of Deep Heat threatening asphyxiation until someone opened a window. The journey took about an hour, which flew by as runners from all over the country (including two from Elswick Harriers) shared funny anecdotes about their expectations and the circumstances of tragic losses that inspired some people’s participation. Upon arrival the 4,000 runners disembarked and walked down to the start with two necessary deposits to be made: firstly to the baggage trucks and then to a discrete location behind a pine tree stump. The weather was perfect and the sun beat down with a cool following wind. Combined with the beautiful landscape, Chris was reminded of his reasons for choosing this marathon as his ‘duck’. Rather than running around a flat city industrial estate he hoped his running would take him to places he may not have otherwise seen and this was by no means a disappointment. Feeling humbled by the beauty surrounded us, ignoring the customary rows of runners peeing, Chris had a realisation that the Loch Ness Marathon was the right location. For Alex, a pine needle in the toe from his foray into the wilderness was the less sublime thought on his mind. At the start we gathered at the 3.20 predicted finish time and were entertained by traditional Scottish pipes, sandwiched between the soundtrack of pumping bass for the ‘Morag McMotivater’. Not the finest combination but it all contributed to the atmosphere. At 10.02 the starting gun was fired and we were off—and fellow TBH runner Steve Cairns already way ahead of us (finishing in an incredible 2.52). The plan was to get through the undulating first eight miles (predominantly downhill) and averaging 7.39 m/m until mile 18 and the extended hill climb for over a mile. But by mile 16 we knew we weren’t going to make it together. With each foot landing Chris could start to feel the beginnings of the calf strains he’d been struggling with over the last month, so he started to focus on his foot landing and keeping his knees high. He’d found this distraction helped in the past but unfortunately the pain grew worse and worse and he began struggling to run side by side with Alex. On Friday evening, on the train on the way up, we’d discussed what we’d do if someone was flagging. Would we leave the other person? Is a race a race, or is it simply the last 26- or however many miles of a long training programme that you have done together? It’s a difficult question. We’d been thinking it might come into play after twenty miles. But we had to face it much earlier. Although not fatigued, Chris couldn’t even run at the pace he’d managed in training. We carried on for the next couple of miles at around 8.40 pace. Then Chris finally gave Alex the nod. Alex went on ahead at 7.30 pace, while Chris battled on with his tight calves. The guys from Bradford who had run the race before told us about the support from the people of Dores at mile 17, just when you were beginning to flag, and he wasn’t wrong. The whole village came out, giving runners that necessary lift before the big hill between 18- and 19- miles. It’s a long, slow climber, without much shade, and by then the sun was definitely playing a role. But unlike the earlier inclinations, there was always a downhill to recover. Not anymore. Now it was just time to get on with the rest of the race. Chris: “I dropped to 8.30 m/m and hoped my calves would loosen but unfortunately I had ten miles of pain ahead. At best I could manage 10 m/m on the flat but the undulating course had me crawling up the hills. Stopping to stretch provided small respite; however, any chance of a speedy finish was long gone. “Aerobically I felt as fresh as I had at the start but my calf muscles felt like they had been transplanted for bricks which had to be transported to the finish line. My stride shortened and I was being overtaken by a constant stream of runners. The enthusiastic support from the people of Inverness certainly spurred me on and this combined with my own pride I managed to limp over the line in 3.45. “Unfortunately my initial feeling was of an overwhelming disappointment. I am aware that just to finish a marathon is an achievement but I wouldn’t have joined a running club if I only wanted to plod around courses with the goal of picking up a finisher’s medal. The joy that running brings me is the personal battle we all experience of trying to push yourself to your limit and beyond finding your best in the most challenging of circumstances. Whilst I will never be competing at the front of a race for a win my satisfaction comes from leaving yourself on the course reaching the end and knowing you could not have done anymore. Sadly in this race I was unable to do that. What a great race report! Well done guys, great times and great effort!! Lest we forget, drunks exist in England too. Clowning around on the actual course during the Marathon of the North for example. Excellent report fellas – good to get two perspectives on the same race. Alex you’re in a great run of form at the moment, long may it continue. Chris 3.45 is a great marathon debut and a time you will surely break in the future, work over the injury and I’m sure your next one will build on the experience. Well done both! Guys, well done. Alex, great work to get through your training and come back from injury with such a strong run. Chris, how to put this politely… you are wrong, you might not know it yet, but you are (in my correct opinion anyway). It’s a solid marathon debut. You have a base to build upon and the times will drop. I’m looking forward to your next few marathons even if you are not (yet). Well done lads, cracking report and excellent run from both of you. Well done lads, very enjoyable to read the two account intertwined. I’d also like to reiterate the comments above 3:45 on debut is a cracking effort, certainly knocks spots of my one and only time at the distance. Until you’ve run the distance at full effort it’s going to be difficult to know how the body will respond. Some more hard graft and you’ll never know what you’ll end up running. I went from a 3:59 marathon in 2010 to running a sub 35 min 10k this year. No need to be disheartened, you’ve done it, you’re a marathoner and you’re only going to get faster!